2.Agreement or concord, peace, friendship, fellowship, and understanding. 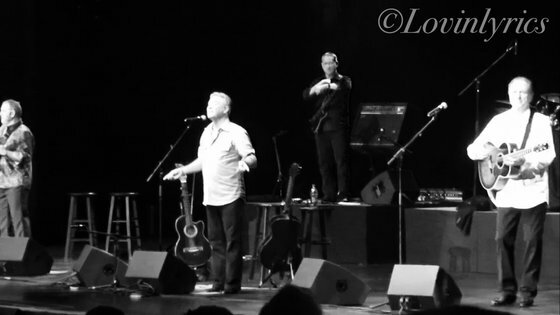 Larry Gatlin and the Gatlin Brothers brought harmony in more than one way to the Alabama Theatre on Friday, January 13, 2017 when they performed for the Pardue Children in Need Benefit. Seeing Larry, Steve and Rudy has been a long time bucket list item of mine, having grown up hearing their music coming from the twin tower speakers of my parents vintage 1970's Sherwood stereo system. I remember running around the house singing "All the Gold In California" into my hairbrush thinking I was a big time singer. Their music has always been a staple in our house, on our road trips and a constant on my own "grown up" playlist. When I heard they were going to be in Myrtle Beach, I knew this was a show I was not going to miss. The theatre was a packed house, finding a parking space wasn't the easiest thing to do. Standing outside waiting on the doors to open, you could hear random people humming or singing Gatlin hits amongst themselves and talking about their favorite Gatlin memories. There was gonna be a lot of love in this house for these 3 country music legends and I could not wait to take my seat and get lost in the beauty of the blending of these 3 voices. We took our seats, the house lights dimmed and finally the show began. The projector began to hum, reflecting memories of the Gatlin's careers on the theatre walls. You really don't get the gist of how much they've done over the years until you sit back and watch. From performing for family in their living room to performing for audiences and dignitaries worldwide. The music kicked off with "Houston" and immediately launched right into some of the best stories you've ever heard. Larry Gatlin is the funniest person on the planet. He did a great thing getting into music, but damn if he couldn't work a comedy club on the side and still make millions. I have never laughed so hard in my life. From his back and forth banter with one heckler in the crowd to his stories about writing music with greats like Roger Miller, it's no wonder half the crowd was constantly up out of their seats running back and forth to the restrooms. LOL! The guy is just a riot. You don't even know! Now back to the music ... ahhhh, the music. It's very rare that I spend an entire concert with a smile plastered across my face and my heart smiling just as big unless it's an Oak Ridge Boys show. Tonight, it happened. I could not wipe the smile off my face, it was like an automatic response that you just can't do anything about. The music was amazing, just wonderful. There were 3 moments that really hit me right smack in the feels, I may or may not have had to wipe away tears but I'd never admit that here, or would I? Moment #2: Larry talked about his relationship with Johnny Cash and June Carter Cash, their friendship and good times. Who knew that Johnny called Larry "Pilgrim"? Not me, but I thought that was kinda cool. Could you imagine picking up the phone and hearing "Hey Pilgrim" in that deep unmistakable voice? Larry, getting choked up talking about the loss of Johnny and June, launched into "Johnny Cash is Dead and His House Burned Down". I don't have video of the performance, but the song is great. I saw more "Pilgrimmage" CD's sold that night than any other CD just because of this one song. Moment #3: The moment the "Midnight Choir" start to sing ... My favorite Gatlin Brothers song has always been "Midnight Choir (The Mogen David Song)." There is something humbling about this song, something emotional and raw. According to Larry, the song was boycotted and people burned records when this song was released because it wasn't "suitable" or it was seen as somehow sacrilegious. Personally, I find it quite the opposite. I find this song as realistic and a picture that sadly a large amount of us have seen - the life of the homeless and those homeless who also happen to be alcoholics. If you've never spent time at a homeless shelter or even taken a minute to speak to a homeless person on the street, then I recommend doing so just to put your life back into a different perspective. This song made an impact on me years ago and it was sung by an artist who wasn't always so lucky and saw life through these same eyes at one time. It's a personal song to so many, yet so many don't want to recognize it. We all know someone whose been down on their luck and questioned God, some of us have done it ourselves. It's the picture of today's reality. The three songs listed above were the 3 that hit me closest to home and made me truly appreciate the talent that was standing on that stage. You don't get it until you see it live. You really don't. They had the audience singing along all night with hits like "Broken Lady", "All the Gold", "She Used to Be Somebody's Baby", and so many others. Between the songs, the tears and the constant jokes and laughter, I have to say I've never come into a show with one level of appreciation and left with one much higher than I ever thought I could have. If you ever have a chance to see Larry Gatlin and the Gatlin Brothers, I would recommend getting a ticket and being in that audience if you want to be a part of country music at it's finest and most honest. I really can't gush enough about this show or these men.